More unique than an egg, but still lovely and chocolaty. 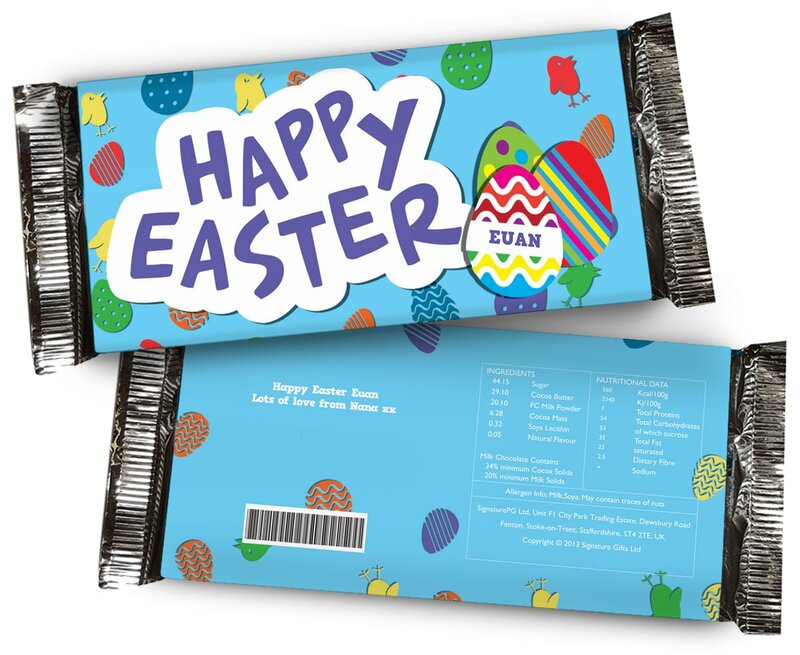 This brightly coloured, personalised bar includes the recipient's name and a message from you, making this Easter gift stand out from the crowd. 100g foil wrapped milk chocolate with a personalised paper wrap. Every child has a favourite teacher. Incorporating any name into the chalkboard design along with a personal message, this gift will make you Teacher's Pet. Personalise this colourful Official Jackie chocolate bar with your chosen name of up to 22 characters. The foil sealed milk chocolate bar is 18.5cm tall and 8cm wide. Personalise this pun-tastic chocolate bar with your chosen name of up to 15 characters. You can also add a message onto the reverse of up to 40 characters. A Wedding favour or a gift for the happy couple, this little gift is both thoughtful and yummy. Your message and the couple's names are included within the chic design. A unique and yummy way to say thank you. Whether it's a retirement, for house-sitting or even for the host of a party, the words 'thank you' are used for so many occasions.